Ladakh region is located in the Jammu and Kashmir state and its inhabitants, the Ladakhi’s, are mainly Buddhist and agriculture remains their mainstay means of earning livelihood and producing food. Though ever since the area was opened to tourists since 1974, the tourism sector has also become a major source of monetary growth. Four mountain ranges cross Ladakh, they being Zanskar, Karakoram, Ladakh and the Greater Himalayan range as does the mighty Indus River that flows through and is fed by its tributaries, the Shyok, Shingo and Zanskar rivers. Leh is the administrative capital of this region and is connected to the rest of the country by two road routes. 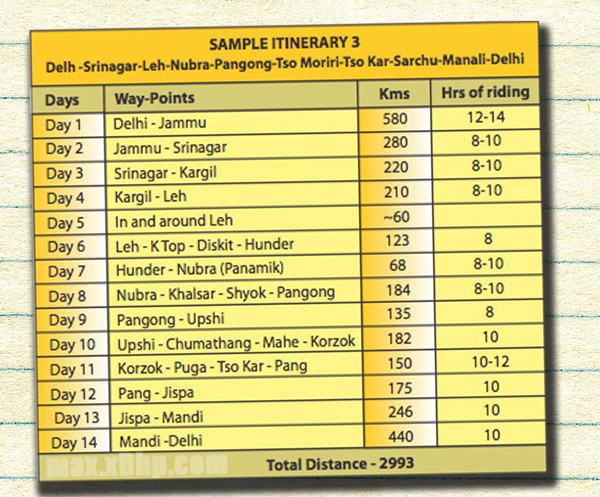 One goes via Jammu, through Srinagar and crosses over the Zojila Pass to get to Leh via Kargil. The other route begins from Manali in Himachal Pradesh, crosses the Rohtang Pass and 4 other high mountain passes before reaching the Leh valley. Apart from high mountain passes, even higher peaks and tumultuous rivers, the Ladakh region is peppered with amazingly beautiful lakes. Ranging from the almost sea-like Pangong Tso (only a third of which is within the Indian territory with the rest being in China) to the picturesque Tso Moriri and the placidly exquisite Tso Kar, each of these water bodies are a heavenly sight to behold. Ladakh being a Buddhist land abounds in monasteries and the welcoming nature of its people makes almost each one of those accessible to the visitor. The Leh city is a bustling retro-modern township and stands in sharp contrast to the relatively untouched and timeless region is resides in. It’s an oasis of urbanity in a sea of centuries old civilization that still feels no great need or shows any urgency to change towards modernity. All the better as the past preserved in equilibrium without depriving anyone of the benefits of change is the ultimate solution. One does get glimpses of such equilibrium when wandering through this amazing land. The road route is closed for almost 6 months a year, from end October to early May (the Manali – Leh route is closed for a month or so more than the Srinagar one) as the high mountain passes remain snow-bound for that time. During this time the only way to get to Leh is by air. 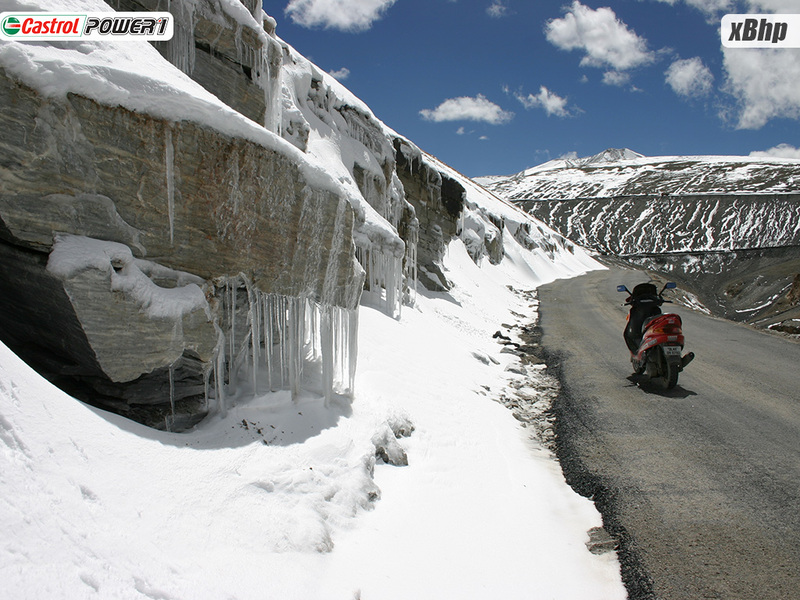 The ariel route is not of obvious interest to a motorcyclist who wants to ride to Leh but attains importance if you want to do a winter ride in and around Leh. May-June – Very hot in the plains with temperatures ranging upto 45 degC. Cooler anywhere above 5000 ft AMSL which means things get better only a short distance from Srinagar or Manali onwards. The Srinagar route makes for less severe cold as the road does not ascend to altitudes as high as the Manali route does. But anywhere above 10,000 ft AMSL, a couple of warm layers with a wind-proof top is necessary, all the more during early mornings and after sundown. June end starts getting the effects of pre-monsoon showers and the high passes on the Manali route can get blocked by sudden snowfalls. July-August: The famous Indian tropical monsoon breaks out in its full glory all over North India and both the routes to Leh are deluged and affected by rains. The plains can vacillate between very hot and humid to deliciously cool depending on the presence and severity of rain. High up on the way to Leh the roads, wherever lacking tarmac cover become slushy, land-slides and mud-slides that can hold up travel for hours or days become common and occasional snowfall/sleet can be encountered at high altitudes above 11,000ft AMSL. The Srinagar route again wins in accessibility while the Manali route, with its difficulties and uncertainties’, attracts the adventurer within. These two months make both routes equally uncertain primarily due to inclement weather and its side effects. September – October: The rains gradually peter off though of late, almost the entire September month is as affected by liquid sunshine as if the monsoon isn’t over yet. The heat in the plains becomes tolerable and anywhere above 5000ft, there’s a nip in the air when the sun is not out in its full glory. The high passes, especially on the Manali – Leh route (Baralacha La, Tanglang La) tend to get snowed out if it rains at lower altitudes. Early September 2010 saw particularly severe snowfall on Baralacha La and Tanglang La that closed up the route for more than a week. Comparatively, Zojila was open on the Srinagar side. October onwards, freezing becomes more a rule after dark and till a little past sunrise at high altitudes. Black ice shows its ugly face on the Manali route and lots of care is needed to ride to Leh on this route mid-October onwards. Rain is conspicuous by its absence and clear blue skies can be expected with near certainty. Temperatures hover around freezing in Leh and go sub-zero anywhere higher. November: The Manali route usually becomes snow0bound by end-October. Zojila on Srinagar side remains open, primarily by the efforts of the BRO (Border Roads Organization) and the Army, but travel on a motorcycle becomes tricky due to the now frequent appearance of black ice and the strong possibility of getting snowed in with your motorcycle across a pass for the entire winter. 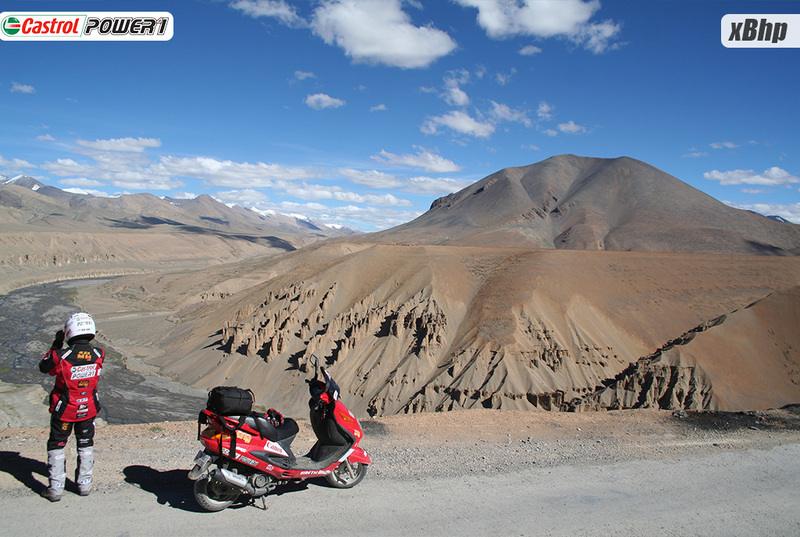 For a motorcyclist (or a motorist) there are two road routes for reaching Leh. For the sake of convenience and detail, we shall describe the route with Delhi as the starting point even though both the routes run common till Ambala which is about 200 kms north of Delhi. The route description here is strongly biased towards those traveling by two-wheels. 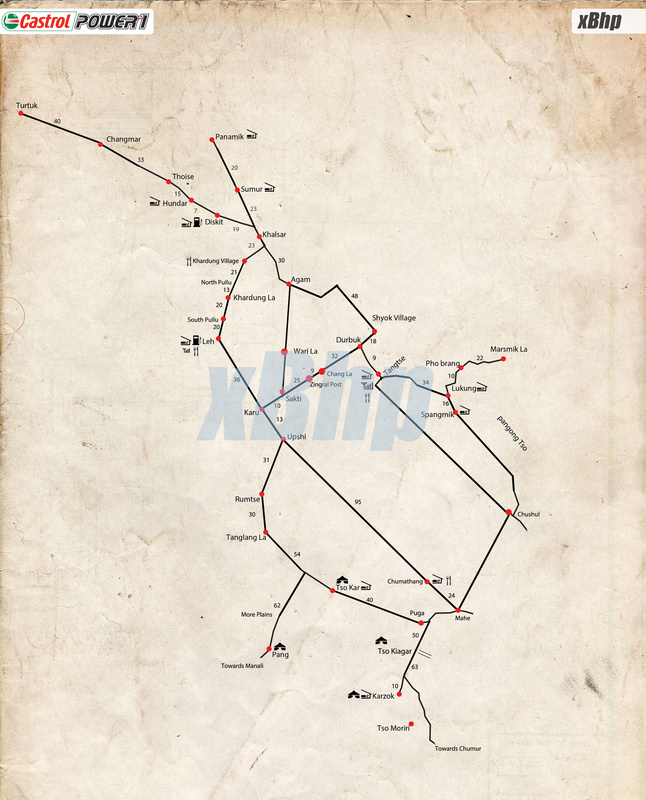 For reference to distances between different way-points, please refer to the accompanying detailed route map in the following pages. This route can actually become the highlight of the trip, as almost 50% of the natural beauty is experienced along this route. Not for the uninitiated. You go unprepared, well, you can get yourself killed! High chances of AMS as you will halt for the first day at 4200m. That’s a rise of 2200m from Manali which is at 2000m, in one day! Dangerous, narrow sections of the road are quite common throughout the route. Mud, lots of mud. Especially at places near Pang and Tanglang la. Couple that with narrow passage, and you have to be really careful. At some stretches, you won’t find anyone. Hence if something goes wrong with you or your bike, you should know how to fix it, as you will have to find a way out yourself. And if you are alone, then God help you! Breathlessness while crossing high passes is a common problem. Snowbound for most of the year. In comparison, Srinagar – Leh opens earlier and closes later. Probability of high passes being snow-bound and closed is greater. After Tandi, no petrol pump for the next 300 kms! This route is flatter and more linear as the highest pass you come across in this route is the Fotu-la which is at a meager 13,500 feet. More places to stay and eat. This route is normally busy, so you if you mess-up at someplace, chances are you’ll find someone to help you out. Much better roads. If you leave aside Zoji la and some stretches near Fotu la, there is proper tarmac all the way through to Leh. In fact the final30 kms to Leh are double lane and marked! You cannot miss passing through ‘Heaven on Earth’ – Kashmir. Climb is easier and less amount of skill level is needed on this route. The gradual increase in altitude helps in acclimatizing better and so there are fewer chances of AMS. Outrageous amount of traffic till Srinagar which is a big turn-off, if you are coming from the plains. The Jammu – Srinagar road is notorious for ill mannered truckies and tempo-travelers. People do not want to stick to their own lanes! Abrupt overtaking at blind corners, useless honking, traffic jams yadda yadda yadda. Given the volatile nature of Kashmir politics, it’s always a risk passing through this route. Only one gateway pass-Zojila which can be a deterrent in terms of too much traffic and uncertainty due to weather. 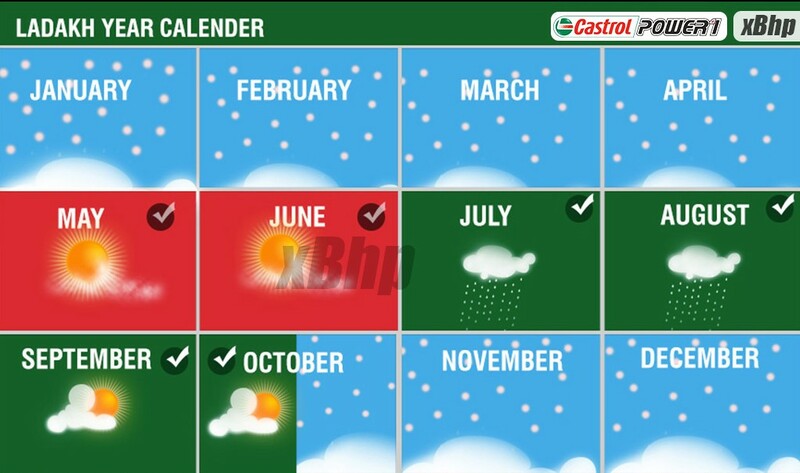 This logo in the above map indicates the cities on the Delhi-Leh-Delhi route in which you can find the Castrol Bike Point to get your bike serviced or repaired in case of a breakdown. In and around Leh! Click on the map to enlarge it! 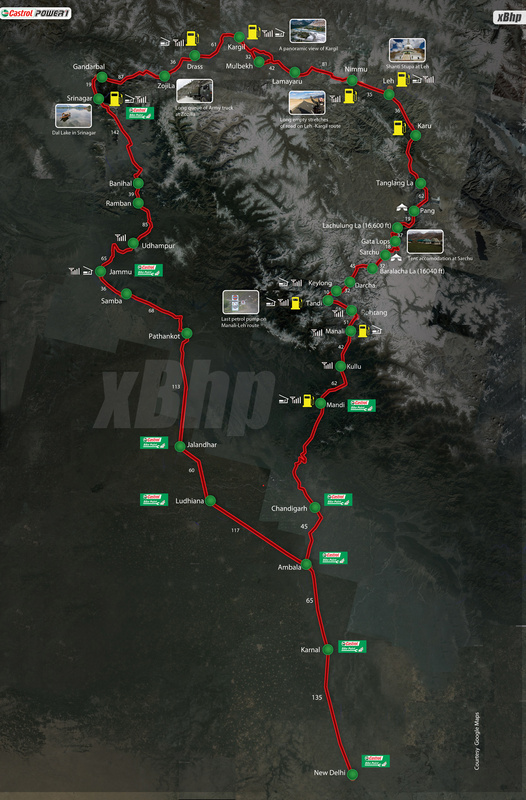 You can find more of these beautiful routes in and around Leh on POWER1Biking Routes and also create your own routes and share them with fellow bikers! 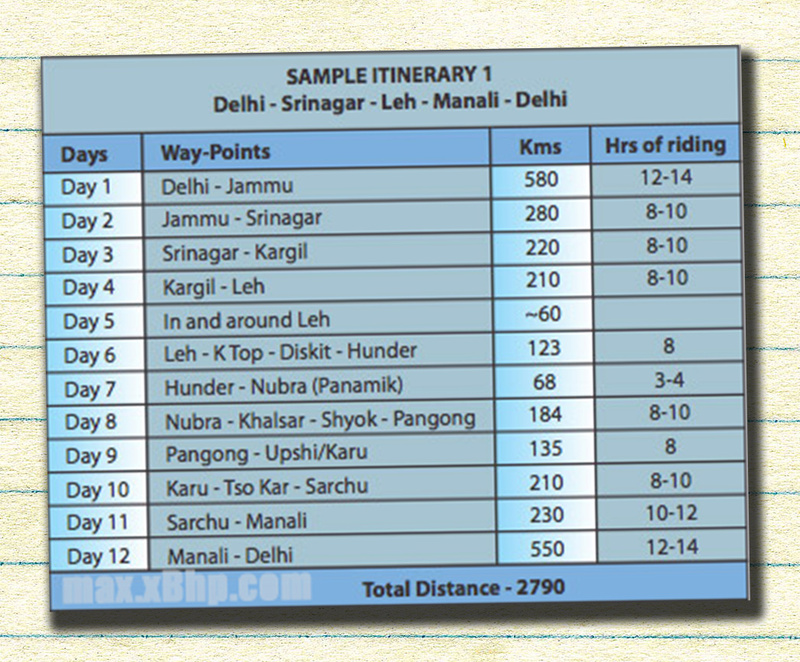 Must say that this post is extremely helpful in planning my ladakh bike trip from Delhi. 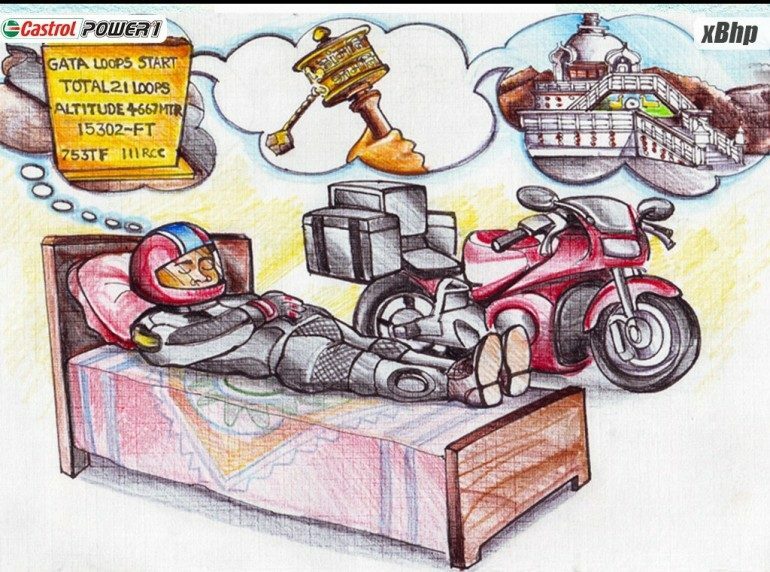 We are 2 riders planning a trips on 22nd July, 2016. 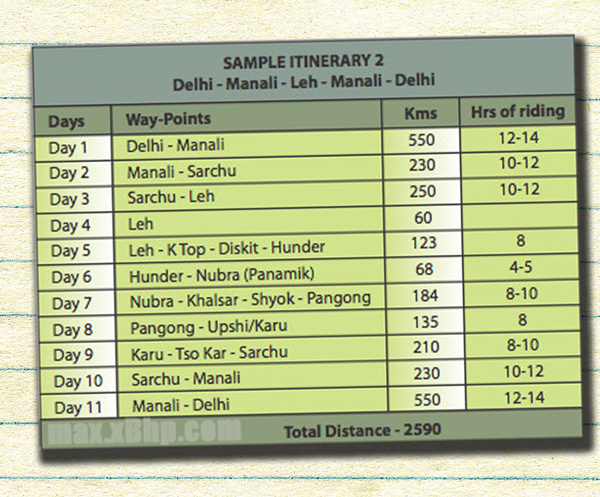 Taking Delhi-Srinagar-Leh-Manali-Delhi route. Would be obliged if you can suggest an itinerary for the same. We have planned a 12 days trip for the same. Check out the sample itinerary 1 on the post. I want the user guide for xbhp. Please send me email about how to use it. Please.